Cyprus Registered Alternative Investment Funds (RAIF) – no CySEC licence required. The new Cyprus Law regulating Alternative Investment Funds, approved by the parliament on 10 July 2018, provides for so-called Registered Alternative Investment Funds (RAIF), which do not need to be licenced by the Cyprus Security and Exchange Commission (CySEC). The new Alternative Investment Funds Law 2018, regulating Alternative Investment Funds registered in Cyprus, which replaces the previous Law 131(I)/2014 regulating the Alternative Investment Funds, has been published by CySEC on 31 July 2018. The new AIF Law is yet only available in Greek language. The provisions regarding Regulated Alternative Investment Funds (RAIFs) are stipulated in Part VIII of the Law. 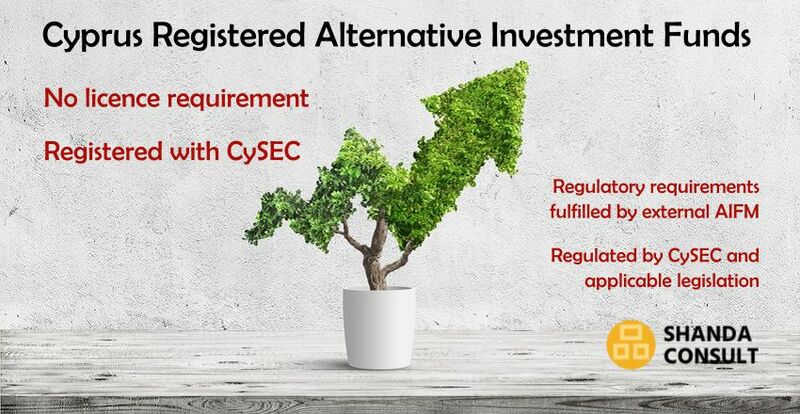 The new Cyprus Law regulating the Alternative Investment Funds now provides for alternative investment funds, called “Registered Alternative Investment Fund”, or shortly RAIF, which do not need to be licensed by CySEC. Regulated Alternative Investment Funds (RAIFs) will be supervised by a mandatory licenced Alternative Investment Fund Manager (AIFM), which supervises the RAIF and provides certain mandatory services (risk management, compliance, internal compliance audit etc. The new law aims to provide a more cost-effective fund vehicle and to reduce drastically the time until a fund can start offering investment opportunities. There has been an increasing demand for unregulated alternative investment fund in Cyprus coming from China, the Middle East and EU countries. there is no limitation for the assets under management of Registered Alternative Investment Fund (RAIF). The new Registered Alternative Investment Fund (RAIF) in Cyprus will drastically ease the procedures to set up a fund by eliminating the need for lengthy authorisation and licencing procedures by CySEC; licencing costs will be reduced substantially. the Alternative Investment Fund Manager will provide the services to the Registered Alternative Investment Fund (RAIF), which are mandatory for “normal” Alternative Investment Funds, such as internal compliance and investor compliance, risk management, internal compliance audit etc. Registered Alternative Investment Funds (RAIF) must invest a minimum of EUR 500.000, which must be realised within the first year. Please feel free to contact us for further information, or if you wish to setup a Registered Alternative Investment Fund in Cyprus, through the contact form below. We will be happy to advice and to assist.